The importance of social media in corporate reputation and business performance in the hotel industry is beyond dispute, and Meliá Hotels International (MHI) is among the companies leading the way. The Spanish-headquartered global hotel group has implemented an extensive social media communication strategy through all its corporate and hotel brand profiles. The strategy has allowed Meliá to rank among the top ten most relevant Ibex 35 companies in social media over the first eight months of 2018 according to the Icarus Analytics Panel carried out by Epsilon Technologies through an analysis of Facebook, Twitter, YouTube, LinkedIn and Instagram. Meliá is present in all the sites analysed and aims to continue improving and extending the content offered on social media due to their importance as communication channels. Earlier this year, MHI was named as the hotel company with the greatest number of followers on social media in Spain according to an analysis by Cool-Tabs, and at the beginning of 2018 its CEO, Gabriel Escarrer Jaume, created public profiles on both Twitter and LinkedIn. 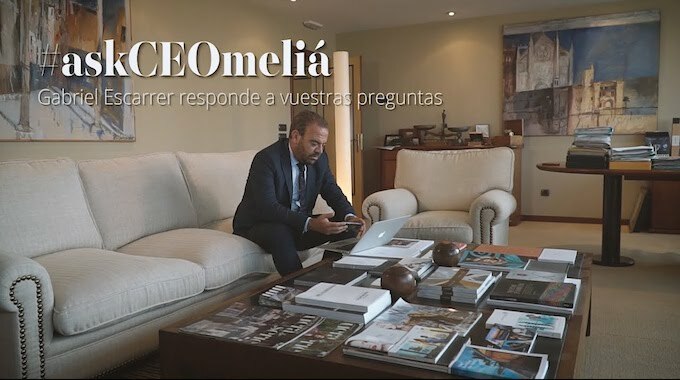 Initiatives such as #AskCEOMeliá – in which Escarrer responds to questions from tweeters in videos and interacts with team members – have helped enhance the visibility of the company, become more interactive and increase awareness of the tourism industry through a different approach. MHI has also implemented a social media programme through which team members can become internal digital brand ambassadors, sharing MHI content through their own personal profiles. In just one year, the programme has generated 58 million views. MHI currently has a total of 6.5 million followers on social media for its corporate and brand profiles, almost 500,000 of which follow its corporate brand, Meliá Hotels International.